A truckers life is a hard one. The life of a trucker is a hard one. The loneliness, the isolation, the distance from your loved ones, and the constant need to stay vigilant. After all, driving a truck means being in charge of a fast-moving mass of metal which could cause untold damage if it went out of control. It's a huge responsibility. 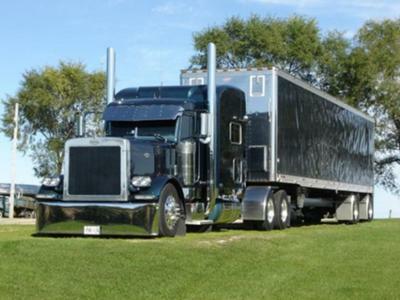 I've picked up many trucking stories along the road, during my 27 year career, and met a lot of other drivers. Some have been wonderful people, others untrustworthy, and others tragic souls lost on the highway. If a truckers life is so hard, what keeps a trucker trucking? Some would say it's the 'romantic lure' of the road. But, in reality, it comes down to money. Trucking may not pay like it used to, but for people like me, who aren't cut out for customer service work, who find it difficult to talk to other people all day, a truckers life, is the only life I know. Driving used to attract more loners and people from the margins, but thanks to better safety regulations, things have settled down, and most truckers are good, honest family people. One of my best friends from the road started out as a family man, before he gave in to the temptations of life on the road and his freedom, and embarked on an affair. He lost everything: kids, wife, home, car, even his beer cooler. But that's the job. It's a constant test of your moral fiber, where every night at a lonesome truckstop is another chance to make a bad call. But I have never strayed, thanks in part to seeing the detrimental effects of trying to live a secret life. It can make you old very quickly. I keep a picture of my family on the dash, and I never take off my wedding ring, no matter what. One of the things that really keeps me going, though, is the chance to spend my days surrounded by mountains, plains, deserts and forests, ....to always be wondering what's round the next bend. There's not much advice I could offer someone starting out nowadays. The business has changed so much. I think it's safer on the road, than it once was. But, thanks to tight profit margins, with trucker's pay getting the squeeze, only the most efficient, dedicated truckers can make a living. All I can say is keep your eyes on the road, keep the tank full and keep your family in your mind. Even if they're not in the truck with you, they're always along for the ride. Comments for A truckers life is a hard one. Life is what you make right? If you want to make things right for the best of all involved, then that's what you do. It can be plain and simple or it could be the ride from hell, it depends on what the person wants for themselves. The demons are there if one allows them to interfere in their daily lives, but has the ability to pass them up as well. People leave their minds behind on this job mostly because they were already predisposed to some sort of mental illness coming from some environmental influences, whether it be genetic or their home surroundings growing up. People take to drugs, cheating, lying for these same types of reasons. there are many walks of life who tire from their life and stray, use drugs, lie, steal, cheat.